For this recipe, use inexpensive white distilled vinegar. It often has pictures of vegetables on the label. No need for fancy vinegars, they’ll only cover up the wonderful pepper flavor. The precise number of jalapenos will depend upon the size of your peppers. 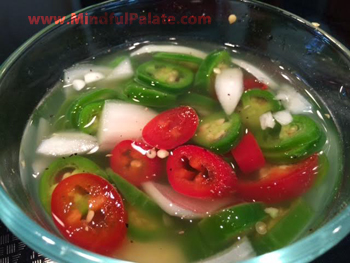 You won’t slice too many if you work with one pepper at a time adding them to the vinegar onion mixture as you slice. If you are new to slicing jalapenos, I suggest putting a plastic sandwich bag over the hand that touches the jalapeno. When you are done slicing, invert the bag, and toss for easy cleanup. If you do hold the jalapeno with your hand, do take care and avoid touching your lips, eyes, or other sensitive skin areas for quite some time after slicing. This is not a canning recipe for long term storage. It is an I Forgot the Pickled Jalapenos! refrigerator method of pickling one container at a time and is only intended to keep in the fridge for a week or so. In a small glass container that has a secure tight fitting lid, combine the water, vinegar, sugar, several shakes of ground black pepper, and about 4-5 twists of the salt grinder. Add the onion to the vinegar mix. Rinse and dry the jalapenos. Cut off the stem end. Then holding the pepper with one hand, slice into rounds of about 1/8 inches in thickness. As you slice, add the rounds to the vinegar mix. When you have added as many slices as you want – making sure they are covered in vinegar – stop slicing! Cover the container and place in the refrigerator for at least 4 hours. Enjoy them on sandwiches, with brisket, or on a plate of nachos! This entry was posted in Spicy, Toppings, Vegetarian and tagged easy, jalapenos, pickled. Bookmark the permalink.